i.e. the secondary terminals are open while the primary is connected to a source of constant sinusoidal voltage of frequency f Hz. The simplifying assumption that the resistances of the windings are negligible, will be made. as the winding resistances in a transformer are of extremely small order. It is, therefore, seen from Eq. (3.6) that maximum flux in a transformer is determined by V1/f(voltage/ frequency) ratio at which it is excited. According to Eq. (3.6) the flux is fully determined by the applied voltage, its frequency and the number of winding turns. This equation is true not only for a transformer but also for any other electromagnetic device operated with sinusoidally varying ac and where the assumption of negligible winding resistance holds. This indeed is the transformation action of the No Load Transformer Phasor Diagram. Its current transformation which is in inverse ratio of turns will be discussed in Section 3.4. 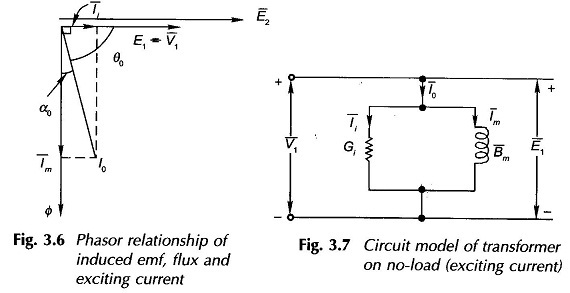 The value of exciting current i0 has to be such that the required mmf is established so as to create the flux demanded by the applied voltage (Eq. (3.6)). If a linear B-H relationship is assumed (devoid of hysteresis and saturation), the exciting current is only magnetizing in nature and is proportional to the sinusoidal flux and in phase with it. This is represented by the phasor im in Fig. 3.6, lagging the induced emf by 90°. However, the presence of hysteresis and the phenomenon of eddy-currents, though of a different physical nature, both demand the flow of active power into the system and as a consequence the exciting current I0 has another component Ii in phase with Ei. Thus, the exciting current lags the induced emf by an angle θ0 slightly less than 90° as shown in the phasor diagram of Fig. 3.6. Indeed it is the hysteresis which causes the current component Ii leading Im by 90° and eddy-currents add more of this component. The effect of saturation nonlinearity is to create a family of odd-harmonic components in the exciting current, the predominant being the third harmonic; this may constitute as large as 35-40% of the exciting current. While these effects will be elaborated in Sec. 3.10, it will be assumed here that the current I0 and its magnetizing component Im, and its core-loss component Ii are sinusoidal on equivalent rms basis. In other words, Im is the magnetizing current and is responsible for the production of flux, while Ii is the core-loss current responsible for the active power being drawn from the source to provide the hysteresis and eddy-current loss.